It's been a rough couple of weeks, truth be told, from a training perspective. I've been sick since my birthday, a solid three weeks ago. Today is the first day in quite a long time I've felt better. I haven't coughed yet today, so there's an accomplishment. The short version is that I coughed hard enough my ribs hurt and my running was tough. The long version is I haven't been sleeping because of a cough so obnoxious my coworkers were concerned. I saw a doctor, who prescribed antibiotics and cough syrup, which seemed to helped me sleep but that was it. During a run Friday, I made it to the two-mile mark before coughing and feeling a crack in my back. I turned back and considered flagging down a state trooper I saw to take my back because I was short of breath, thinking I broke a rib. Needless to say, I did not run Saturday. So Sunday, the trail stretched before me. I had zero faith this run would go well. My tummy was full of greasy food, I was not well-rested and my rib still hurt. But alas, the worst that could happen is I'd have to walk. I distracted myself, tried not to think about it, and consciously fought the urge to cough at every crosswalk. When I finally got back to the car, I was shocked. I ran the entire 13.1, busted rib and all. I didn't have to walk, I barely wanted to quit and in fact, I think I could have ran even a bit further. I didn't, because no need to push my limits. It's always refreshing, and frankly shocking, to see I've still got it. It wasn't my fastest run, but in many ways, it was even more fulfilling that a PR. It was a battle of wills and against my own doubts. 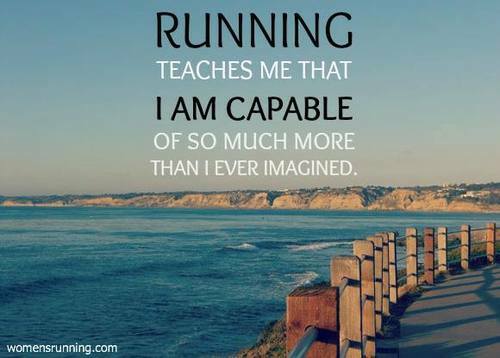 It's amazing that running not only fortifies your heart and body, but also builds up your confidence. Not sure what is going around, but seems like everyone is getting hit with something. I got sick back in September and took a month until I was somewhat back to normal again. I still have no idea how I ran both my marathon and the 50 miler while still sick. I joke that he 50 miler turned my body toxic so the germs finally left me. Just be careful not to over do it. Don't need a relapse.